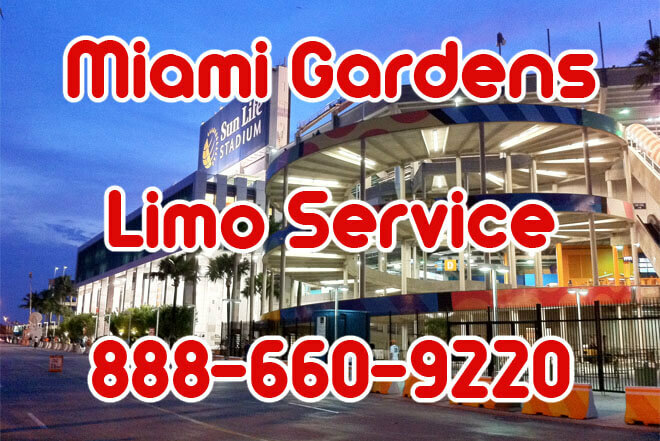 Compare pricing for limo service in Miami Gardens, FL. Car service, transportation and limo rentals near Miami Gardens. Price4Limo has over 12,000 vehicles in our inventory with photos and prices for you to choose for your transportation needs. Getting a free quote takes less than 30 seconds and no email is required! 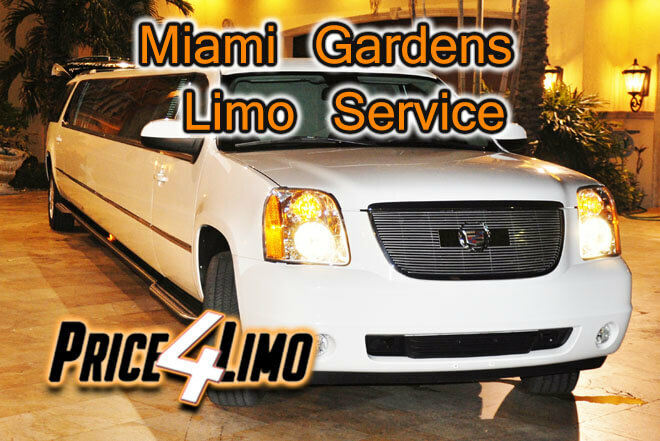 Limo Service Miami Gardens, FL. 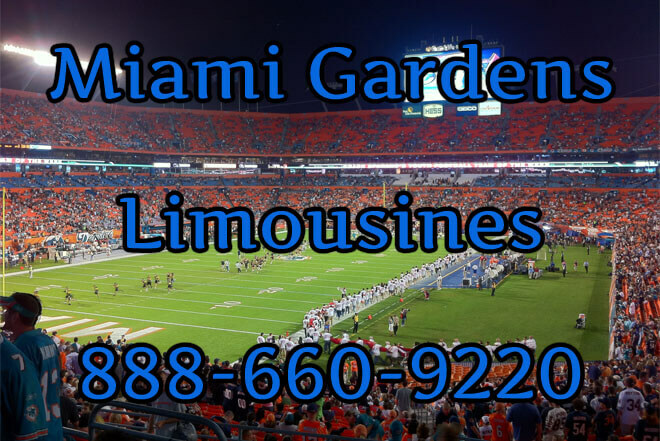 Miami Gardens Limousine Rental brings affordable limo prices to the entire area of Miami Gardens and surrounding cities like Coral Gables, Dania, Miami, Opa Locka, Plantation, Pembroke Pines, Hollywood, Fort Lauderdale, Hallandale, Hialeah and Miami Beach. We have built our reputation on customer care and outstanding limousine service, providing the lowest limo prices. And we offer an elite fleet of classic sedan and stretch limos, along with the new generation of awesome transportation service. Preview Miami Gardens Limo and Party Bus Fleet. A suburban city of Miami and located in Miami-Dade County, Miami Gardens is the largest city in the Sunshine State to boast a predominantly African-American population. With its proximity to Miami, Miami Beach and Biscayne Bay, there is a plethora of shopping, world-class cuisine, nightlife, festivals and events, entertainment and cultural amenities. Carnival Miami is a nine-day festival with concerts at the Orange Bowl, jazz performances and skate contests. The Miami Reggae Festival showcases numerous acts in downtown arenas, and there are multiple performance art companies, including the Miami City Ballet. The Miami Heat and the Miami Dolphins fill the American Airlines Arena and the Pro Player Stadium, respectively. You also have the Florida Marlins and Panthers to cheer for, as well as the University of Miami Hurricanes. South Beach is a famous “hip” destination for shopping and nightlife; and the Florida Keys are a popular destination for day (or longer) trips. All our vehicles feature the latest in luxury touches, amenities and options. Our trained staff is available around the clock to answer questions and ensure you get the right Miami Gardens FL Limo Rental for your occasion. Click or call to get limo quotes for 33056 or any other nearby address. From the sleek Lincoln Stretch for corporate occasions to the fierce Range Rover Limo for the Dolphins game, we’ve got the wheels to get you there. A classic black Chrysler 300 Stretch is the way to attend the Miami City Ballet. 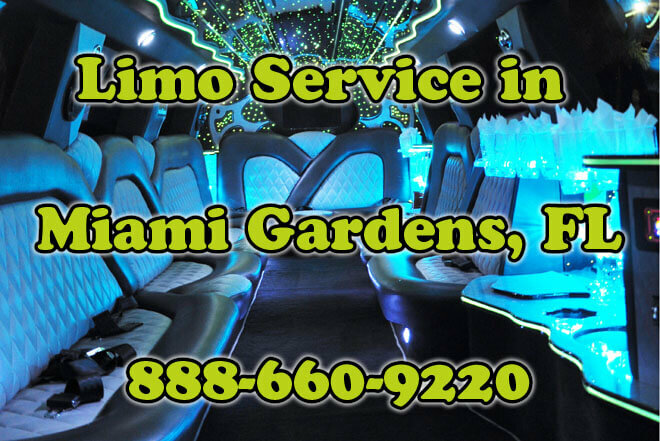 This Miami Gardens FL Limos favorite is also perfect for prom night or graduation, or any other intimate celebration. A romantic dinner in Miami at Zuma or Two Chef’s is made unforgettable when you relax in your vehicle on the way to dancing at Club Space. Bachelor and bachelorette parties are enhanced by limousine service, and we offer a white version for her - also the crowning touch for wedding day transportation. There’s no better way for large groups to enjoy a night in Miami than on a vehicle from Miami Gardens Florida Limo. Start with a concert at Bayfront Park Amphitheater, then recharge with tapas and cocktails at Blue Collar. Hop through the hot spots, from The Vagabond to Miami Velvet, then dance the night away at Eve. Enjoy a nightcap at The Bank before heading home in the comfort of your transportation service. Birthdays, anniversaries, shopping and spa day, sporting events, graduation, bar mitzvahs and bat mitzvahs, staff shuttle to the convention center or a day trip with the kids are all reasons to enjoy the affordable luxury of a limousine.